If you haven’t visited Madison before, it’s a little hard to describe. Madison provides the friendliness of a medium-sized city with a lot of the attractions of a bigger one — and this is almost certainly due to the presence of the University of Wisconsin campus, occupying a subtle 933 acres through the center of the city. A fannish wit once described Madison as “a cross between Seattle without the ocean and Austin without the heat.” We hope you will venture out of the hotel while you are here and enjoy our great city! Madison weather in May can be… well… unpredictable. You might like to check the weather forecast at Channel 3000 as the date gets close. The website also has local news and other links, including a pollen forecast on the weather page. Should you be driving to Madison, the Wisconsin Department of Transportation has a page about current highway construction, as do the Illinois, Minnesota, and Iowa departments of transportation. You might also like to look at this listing of Madison construction closures as well. We also try to post an annual update on our blog about a week or two out from the convention. Two local events which may cause traffic delays or detours (as well as being of interest to some members) are Bratfest and the Madison Marathon — both of which are held over Memorial Day weekend, just like WisCon. For nightlife and restaurant info across all of Madison, we recommend the Isthmus Daily Page. The Isthmus is the local free weekly newspaper. And don’t forget to tour the justly-famous Dane County Farmer’s Market, held on Capitol Square, just outside the Madison Concourse Hotel’s doors. It is the largest producer-only farmers’ market in the country, with every item on sale produced locally by the vendor behind the table. The Greater Madison Convention and Visitor’s Bureau has as many things on their site as syllables in their name, including information about local attractions such as museums and Madison’s very fine free zoo. This is easy, since Madison has only one airport: Dane County Regional (MSN). There has been no special discount arranged for air travel to WisCon. Check for flights with Frontier, a smaller airline which provides service to Madison from some hub cities. Refer to the Dane County Regional Airport list of airlines and list of hub cities for additional options. The Madison airport is small. There are three baggage claim carousels right next to each other. The taxi rank is outside the baggage claim area. See the section “Getting Around Madison: Cabs” for information about cabs. Van Galder (800-747-0994) runs regular service from Chicago’s O’Hare and Midway airports and the Chicago Amtrak station to the Chazen Museum at 800 University Avenue in Madison (which is about 3/4 mile from the Concourse Hotel). The bus also stops along the way in Rockford, IL, Beloit, WI, and Janesville, WI. One-way tickets ($30 or $32 one-way, depending on the trip’s origin) can be purchased at the terminals or from the bus driver. Badger Coaches (608-255-6771) makes trips from the Milwaukee airport (Mitchell Field) and Madison, dropping off at the Chazen Museum. Tickets cost $23 one way when purchased online. Megabus now provides service from Chicago and Minneapolis to Madison. 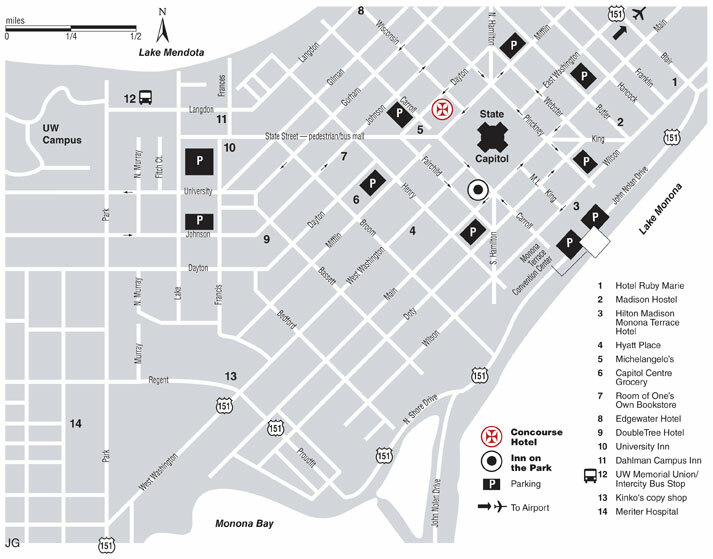 It stops at Dutch Mill Park and Ride outside of town, and at the Chazen Museum at 800 University Avenue in Madison. Fares tend to be extremely low, especially if you book well in advance. Once at the Chazen you may call the Concourse to catch a ride on the hotel’s courtesy shuttle (608-257-6000). This service is usually only for guests arriving at the airport but they will pick you up if they’re not busy. If you feel like walking 3/4 of a mile to the hotel, follow the downtown Madison map above. Greyhound also provides service between Minneapolis (and other cities) and Madison. Fares are higher, and there are multiple stops along the way, but it gets you there. Greyhound stops at the Chazen Museum. From Chicago: North on Hwy 90 to Hwy 12/18 West (also called the “Beltline”). Take the John Nolan Drive exit north – you’ll get a nice view of the skyline and eventually pass underneath the Monona Terrace Convention Center. At the second traffic light after the Center, continue straight through the light onto Blair (look at the downtown map). After two blocks, turn left onto East Washington Avenue. From Minneapolis: South on Hwy 90/94 to Hwy 151 South, which becomes East Washington Avenue. From Milwaukee: West on Hwy 94 to Hwy 30 West. Follow signs for Hwy 151 South/Capitol/Campus (it’s a tight right-hand exit off Hwy 30). Hwy 151 South becomes East Washington Avenue. From Iowa: East on Hwy 151 to Hwy 12/18 East (also called the “Beltline”). Take the John Nolan Drive exit north – you’ll get a nice view of the skyline and eventually pass underneath the new Monona Terrace Convention Center. At second traffic light after the Center, continue straight through the light onto Blair (look at the downtown Madison map above). After two blocks, turn left onto East Washington Avenue. Once on East Washington Avenue: Head toward the Capitol building. (See downtown map above.) Admire the skyline. Two blocks before the Capitol Square turn right onto Webster St.; after two blocks turn left at traffic light onto Dayton St. (90° angle to Dayton; don’t take Hamilton which is a sharper 45° angle to Capitol Square); the Concourse is on your left after two blocks between Wisconsin Ave. and Carroll St. The nearest Amtrak station is in Columbus, 25 miles north of Madison on Hwy 151. There is no direct transportation from there, so be sure to make plans to have someone pick you up in Columbus. There are also stations in Chicago, Milwaukee, and Portage. There are plenty of restaurants near the hotel. 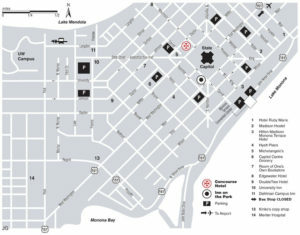 The downtown area has plenty of shops, including drugstores for necessities. Generally speaking, you won’t need to rely on extra transportation unless you are planning to sightsee or need to shop for an evening party. For late-night travel after the Concourse’s hotel shuttle stops running, WisCon offers taxi vouchers. The Madison bus system channels most of its routes within a few blocks of the Concourse. For routes and schedule contact Madison Metro at 608-266-4466 (TDD 608-267-1143). Google Maps is also a good resource for route and schedule information. Cash fare is $2 or $1 for disabled/senior citizens. Day passes are available for $4.50 and can be purchased on the bus. Always double-check the bus detour information!! Locals also recommend the Mobile UW app for bus routes, schedules, and realtime bus tracking. B Cycle Bikes is a bike rental option, with short term memberships for visitors from out of town. Free underground parking is NOT available at the Concourse. Standard parking charge is $15 per vehicle night for all registered guests (this will appear on your hotel bill). If you do not have a Concourse sleeping room, parking costs $1.50/hour up to $17 max. You can unload in the hotel parking garage and take the elevators up to the lobby. Clearance in this ramp is low! Just 5’6″. Additional parking for vans and other vehicles is available in the public parking ramp a half block down Dayton St. at Carroll St. You may still unload in the hotel parking garage (no fee) and take the elevators up to the lobby. You can check live parking availability online with the City of Madison.